Gregg Krebsbach was raised on a farm in northeast North Dakota. He graduated from the University of North Dakota in 1975 with a degree in Business Administration and post graduate studies in crop production agriculture at North Dakota State University. Gregg has owned and operated both irrigated and dry land farms in North and South Dakota raising potatoes, wheat, corn, beans, sunflower, barley, and other crops. He was appointed to the South Dakota Wheat Commission in 1998 and served for nine years. During this time he held seats on the U.S. Wheat Associates Board of Directors and the U.S. Wheat Export Trade and Education Commission, both in Washington DC. Gregg has led U.S. trade teams to Brazil, Chile, Peru, Columbia, Mexico, Korea, and Cuba. Gregg, and his wife Karla, live in Rapid City, South Dakota where he continues to be active in their family farm. His farming experiences have given him a vast understanding and knowledge of production agriculture. He has been active as a real estate broker since 2006 and uses this broad knowledge to give his clients the competitive edge needed to facilitate the buying and selling of their farm or ranch. 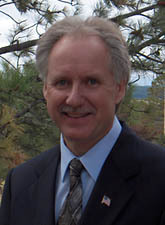 Gregg is licensed in South Dakota and Montana.